Let it snow, please let it snow. It was morning, my least favourite time of day and I was tired. I’d worked until 2 am and was due back in at 10. I was still blurry eyed when I tore open the curtains and was half-way to my dresser-mirror, ready to contemplate the enormous bags that had inevitably festered themselves below my eyes, when I did a double take and let out a tiny squeal. I had not seen this coming. Granted, it’s been cold. But given that being cold is my default it would have been a leap to expect snow. I could have checked the weather forecast but with such foresight my life would be entirely without thrills. I squealed again on the way to the train station and smiled stupidly at strangers, who looked irritated as they battled through the cold. I sat at a computer beside a window and tried to sound hip as I translated a technology show, known apparently for its ironic tone and trendy catchphrases. But all I could think about was snow. Snow is the material which exempts me from adulthood. It is the compound which brings a rush through my body, makes my heart skip and causes me to squeal. I spent every winter of my childhood in a continued state of daring hope followed by crushing disappointment. I remember vividly rushing into my parents’ bedroom at an ungodly hour to check if it had snowed overnight. I remember the familiar sadness that overcame me as soon as the green of the grass and the bleak black of the sycamore branches in the garden were revealed. Grown-ups don’t like snow. They say it’s a pain. It causes traffic chaos and turns to sludge. Two years ago, LSB took me to the Christmas markets in Nurnberg. It was possibly the best move he could have made in our relationship (which would you believe, celebrated its 5th birthday last week; he sent me a card with a crocodile wearing a party hat and blowing out a candle beneath the caption “5 Today”). The snow reached up to our knees and we spent three glorious days drinking mulled wine and hot chocolate laced with amaretto. For those of you nostalgic for my juvenilia, you can read about my experience with the Christmas markets in Regensburg here. 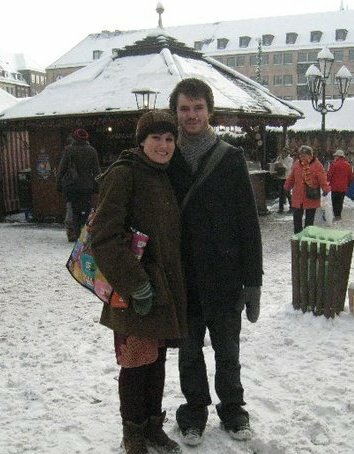 LSB and me at the Christmas markets in Nuernberg. That day the snow was not so deep..
By the time I completed my last jazzy sentence for the technology show, the snow had disappeared but the feeling remained. I headed into town and spent the evening wandering around the Christmas markets at Alexander Platz. I treated myself to a little cardboard plate of rosemary potatoes. I even paid an extra 50 cent for Tzatziki. The texture was divine, the rosemary subtle but brilliant. But they were cold. As I waiting for the underground home, I watched an old woman drinking beer. She was wearing Birkenstock sandals with socks. She had a wide face and a big forehead. She almost looked noble but I suspect in fact that she was very sad.